We arrived in Paris on Saturday. After a dreadfully uncomfortable flight on American Airlines (I believe in naming the guilty! ), we arrived tired, grumpy, hot, dehydrated and minus one suitcase (it showed up later that afternoon). Once we checked into our hotel we napped for a couple of hours. By then it was time to have dinner. I had decided that what we really needed to boost our energy was steak frites which is basically steak and fries. Ok, so what is special about steak and fries when you can get it in any town in America at Golden Corral? Well, first of all, the French invented steak and fries. Secondly, the meat is a gorgeous, high quality cut. Thirdly, the fries are made from fresh potatoes not frozen white lumps that were potatoes in 1987. Finally, the most excellent example of steak frites can be had at a Paris establishment called Relais de l'Entrecote located on the rue Marbeuf off of the Champs Elysee. These people have their own entry in Wikipedia! The only thing on their menu is steak frites preceded by a salad with walnuts and a Dijon mustard, vinegar, oil dressing and a choice of desserts. I wish I'd taken pictures. The steak came sliced with a mountain of fries and sitting in a "secret sauce" that was loaded with butter and possibly a hint of rosemary. For dessert, I ordered profiteroles which are baby cream puffs filled with ice cream and drizzled with chocolate sauce. My parents had 3 scoops of ice cream--vanilla, coffee, and almond--with a caramel sauce. Both desserts were wonderful. The chocolate sauce on the profiteroles was made with dark, rich chocolate. The caramel sauce on the ice cream was pure butter. After dinner we walked down the Champs Elysee back to Place de la Concorde where we took the metro to our hotel. It was a perfect evening! Especially since the sun didn't set until well after 11pm. 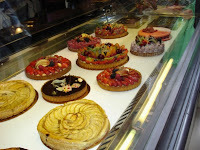 The pastries in France are a reason to live and are a sight to behold. We ate pastries every day, sometimes twice a day! 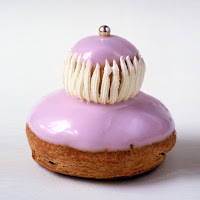 Eclairs, cream puffs (religieuse), madeleines (little pound cake type things), florentines, milles feuilles (Napoleons), palmiers, meringues, tarts, macaroons. My mother has quite a penchant for meringues. They can be found in nearly every patisserie, so we ate quite a few. She also really likes coffee flavored eclairs. The very best pastry we ate, however, was a palmier from the famed gourmet grocer Fauchon at Place de la Madeleine. A palmier is layers of puff pastry with sugar and butter rolled into a heart shape. Simple ingredients but truly divine when executed to perfection by the masters at Fauchon. Do not go to Paris without getting one. Fauchon is also know for it's madeleine's. Typically this little tea cake is flavored with lemon. At Fauchon the master bakers experiment with all kinds of flavors. They were good but they did pale in comparison to the palmier. I like my madelienes best dipped in a hot cup of tea or coffee. Overcome by our delight, we forgot to take pictures of the palmier! The other temple of pastry delights in Paris is a place called Laduree located also at Place de la Madeleine and on the Champs Elysee. They specialize in macaroons. These are not your typical coconut macaroon. You can see from the picture on the left that these are brightly colored cookies. A macaroon is two cookies, flavored with coconut and other things, with a butter cream filling sandwiched between them. We tried them in pistachio, vanilla, strawberry, raspberry, coffee, and chocolate. Butter cream. Need I say more? 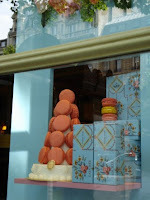 Everything at Laduree looked wonderful. I also tried a religieuse au rose (a rose-water flavored cream puff) mostly because it was pink! How could I not buy a pink cream puff? Now, on the short list of things I hate to eat is Turkish delight which is an evil jelly like candy flavored with rose water that the British seem to love. Yes, it is pink but it is vile. So I didn't high hopes for the pink cream puff. To my delight, it was delicious. The rose water delicately flavored the pink creamy filling which contained a hint of cherry too. I hope there are pink cream puffs in heaven. The spectacular presentation alone merits attention, but the fact that these delicious morsels taste as beautiful as they look, is truly wonderful. 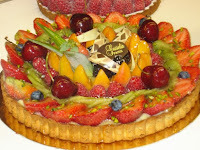 French pastries are the intersection of food and art! Fortunately, we walked about 8 miles every day so eating all of these delectable morsels did not adversely impact our waist lines! Thank goodness. I also discovered that eating as many pastries as I can manage in 10 days makes me not want to eat dessert ever again...or at least until I go back to France! I found a darling little bistro on the Ile de la Cite on the rue du Cloitre which runs along southern side of the cathedral Notre Dame (left if you are facing it). According to my sources, including Zagat's, this little place is a gem amidst overpriced, average, touristy cafes. They specialize in cuisine from the region of Burgundy. The place is small, lined with mirrors and long wooden tables with benches. In the 17th century it was the house of one of the priests at the cathedral. At Le Vieux Bistro, one friend and I ordered escargots. This was the first time I'd tried them. They were wonderful. The taste and texture remind me of mushrooms. They were served in the typical fashion: by the dozen in a ceramic dish swimming in melted butter with garlic and parsley. 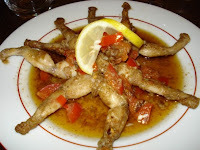 My mother ordered frogs legs. She nearly licked her plate so they must've been good. They were cooked in a tomato, lemon and butter sauce. Rich and delicious! My dad and our friends ordered huge salads with goat cheese croutons. The lettuce was baby greens mixed with frisee (curly endive). The goat cheese was strong and creamy, perfectly browned atop crusty slices of bread. For drinks we ordered white wine from the Loire. It was perfect! The waitress was delighted that I was taking pictures of the food. She actually thanked me for it! There are two types of cafes in Paris: the famous touristy ones where you pay $10 for a cup of coffee and the local ones on the average corner where you can get coffee for the bargain price of $5 a cup. Both are fun options for people-watching and getting a decent cup of coffee, but real Parisians do not usually hang out at Les Deux Magots (St. Germain) or Cafe de la Paix (Place de l'Opera). I really fell in love with the local cafe by our hotel just at the corner of rue St. Lazare by the Trinite metro stop. The coffee was great, not $10, and the proprietor started to recognize us as regulars. So, if you go to Paris, find a cafe near your hotel and go every day. When you are finished with a day of shopping or site seeing stop back by your local cafe for a kir royale which is champagne and creme de cassis. 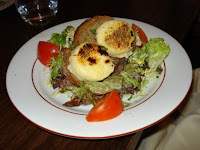 A note on breakfasts: most Parisian hotels seem to offer a continental breakfast for around 10 euros. Skip the hotel breakfast and go to your local cafe instead and pick up a croissant or pain au chocolat on the way. In addition there are plenty of vegetable and fruit stands outside of local grocery shops. Pick up some fruit. We got some GREAT peaches and apricots from one of these little shops. Besides there being two types of cafes, there are also two types of coffee: cafe noir and cafe creme (or au lait). Noir is basically espresso. Cafe au lait or creme is noir with steamed milk kind of like a latte. Don't embarrass yourself and asked for skim milk, soy milk, and other such travesties. Most places seem to have decaf as an option nowadays, unlike 20 years ago when I went to France for the first time. But seriously, if you have a problem with caffeine, order a "tisane" instead. Tisane is herbal tea. I was in coffee heaven. I have mentioned before that I prefer my coffee as black as sin, as strong as death and as hot as hell. My poor father, on the other hand, likes what I consider lukewarm brown water. French coffee required him to put both suger and milk in his cup to make it palatable. Poor guy was glad to get home to have a cup of weak, American brew. At one point he made me ask for American style coffee. The young French woman had no idea what I was talking about, but she was very eagar to accomodate whatever we needed. So I ordered a pot of hot water so he could dilute his coffee. I love my parents, but we really part ways when it comes to java. Every single meal was great. Is it possible to get bad food in France? I hear it is, but I sure didn't taste any. I ate the best pate, the best palmier, the best escargots, the best veal, and so on. A cup of coffee and a glass of wine can be had for almost the same price. I love that! Love love love France. Everyone was friendly. Everywhere was clean. Once I've recovered from the journey, I'll write and post pictures about the food. Meanwhile I'm on a vegetable detox sans butter, cream, and sugar for at least a week! I so completely indulged in my gourmande ways, that I am actually ready for some plain food. And, by the way, the French like Americans. I am leaving tomorrow for Paris with my parents. I am beside myself with joy! My 'rents are fun and fortunately pretty adventerous. I could easily spend the entire time in Paris eating. Unfortunately there are only three meals in a day! I also don't want to be as wide as I am tall. PLus my eyes are bigger than my stomach most of the time. My blog will be dark until I get back. Lights out because I do not believe in taking computers on vacation. Love the web, but in my heart of hearts I am a Luddite. I don't want a computer, a microwave, a dvd player, a blender, an mp3 player, a cell phone or a bagel slicer. I don't even really need a Kitchen Aid or a coffee pot with a timer (that I never use). So while I am in my Luddite bliss of reading news while getting gray smudges on my fingers, drinking my coffee out of china instead of styrofoam whatever, and walking my feet off (Dad picked up some moleskin), know that I love you all and will be back soon with tales of my sojourn. I plan to do a post on Monday, June 25, as soon as I return (unless my plane is late and I don't get back until June 26). Eat joyfully and buy local produce! Memorial Day weekend I went up to Lake Summit in the NC mountains with my friend. She and I cooked a fine Sunday lunch that included this recipe from a cookbook that I found in her mom's kitchen called The Junior League at Home. I am not so much a Junior League kind of girl, but those women can cook, especially the Southern ones! Their recipes are tried and tested and usually fairly easy because who really wants to slave in the kitchen all night after a day of tennis? OK that was a cheap shot. But seriously when I want a recipe for coconut cake or pound cake or champagne punch who do I call? My Junior League friends. They are very experienced hostesses. This recipe is an easy, one-dish wonder. Serve it with a salad and lots of baguette. The cooked garlic squeezes nicely out of its papery skin and is wonderful smushed onto a slice of bread or a bite of the chicken. Preheat oven to 375 degrees. Put chicken skin side up in a shallow baking pan. Sprinkle all ingredients over chicken. Bake covered w/ foil for 40 minutes. Remove foil and bake another 15 minutes until chicken has browned and the juices run clear. Dinner at Nana's: wild boar! Tonight I had dinner at Nana's with a friend. The menu was more spectacularly inspired than usual. It was plate-licking good. I had wild boar with bernaise sauce and grilled radicchio and a root vegetable that I did not recognize, but who cares about root vegetables when there is wild boar on the menu! I first disovered wild boar when living in England and France. It is kind of like pork but the texture is smoother and the flavor is sweeter and gamey. I don't know how else to describe it, but I seriously wanted to lick my plate at Nana's. I should have done it just to shock people. My friend, who has lovely manners and would never lick a plate even if I bribed him, orderd a Kobe beef flank steak with polenta, cipollini onions, and rapini. Apparently it was real Kobe beef (these cows live their lives drunk on beer). I don't think it tasted any different than any top quality piece of beef in a nice restaurant, BUT its tenderness was amazing. Usually flank steak is tough, sometimes tougher than shoe leather, but this was as tender as a filet. For dessert I ordered a strawberry crostada with candied citrus peel and ice cream. My friend ordered creme fraiche, butter pecan ice cream. Both were delicious. Two bites in, we traded plates. I love love love butter pecan ice cream. I'm not really into hunting but I might just give it a try if I can get me a wild boar! In the meantime, head to Nana's before they change their menu! I surveyed my kitchen and pondered what to make for lunch. I had four potatoes that I bought at the farmers' market last week that really needed to be eaten before they start growing eyes. A friend of mine who doesn't cook much (because her loser ex didn't like her cooking...idiot man!) told me that she has been fixing Spanish tortillas quite often for her kids. Inspired my friend and my potatoes, I endeavored to make one with recollections of wonderful tortillas served as tapas in when I was in Madrid with my best friend from college. The Spanish tortilla is nothing like a Mexican tortilla. In fact, they are not even closely related except in terminology. The Spanish version resembles an omelet but even that does not do it descriptive justice. It is layers of onion and potato, well seasoned, cooked with beaten eggs. It is a one dish wonder that combines a starch and protein and only requires a salad and a glass of wine to make it dinner. Put oil in a cast iron skillet over medium heat. When it is hot, layer the potatoes and onions. Season to your taste. Cook gently until the onions and potatoes are tender. Maybe 10 minutes or so but do not let them get overly brown. Pour eggs over onions and potatoes. Stir and flatten with a spatula. Cook gently until the eggs and potatoes start to brown on the bottom. You'll have to look because I wasn't timing it. It is less than 10 minutes. Remove the skillet from the heat and put a plate over it to invert the tortilla onto the plate. Then slide the tortilla, brown side up, back into the skillet. Cook until this other side is brown. Then invert it onto the plate again. Let it cool for 2 minutes and then slice it into triangles as if it were a pie. You can cut it immediately but it holds together better if it cools. You can serve it warm but you can also serve it room temperature. One afternoon in Paris I turned to my friend Stella who was from Arkansas and asked her what she missed the most about the States. She drawled, "Ah miyuss cayat hed bizcuts and reyud eyhhh gravuh." No one outside of the America understands biscuits and gravy much less Stella's accent. I decided a few months ago that I would try the top three most recommended biscuit restaurants to see which place sells the best ones. I sampled egg biscuits from Biscuitville on 15-501 business (frighteninly near my house), Sunrise Biscuits on Franklin St., and Bojangles. I am a frequent visitor to Biscuitville and an occasional visitor to Bojangles. Sunrise is nowhere near my house so I was excited about trying it. Oh what a let down! Sunrise microwaves their biscuits I'm sure of it! The flavor was good but the texture had that rubbery bread texture that happens when bread gets microwaved. Bojangles biscuits are wonderful but very heavy on the grease. They are also huge bordering on the size of cat heads. Bojangles biscuits taste slightly processed and somewhat fast foodish as well. I was surprised, and delighted because of proximity, to discover that Biscuitville makes the superior biscuit. The biscuits are not as large or, thankfully, as greasy as Bojangles. They are fluffy and fresh with the right amount of saltiness that does not overpower. They also do not use microwaves. So if you are going to spend your calories on biscuits, go to Biscuitville. Gravy, on the other hand, is a different matter. The best gravy in town is red eye gravy from Big Ed's in Raleigh or bacon gravy made right in your own kitchen. I've not yet found the best sausage gravy. I'm still looking. I'm partial to gravy made with bacon fat. Planning for Paris: $600 food? Since the fried zucchini flower experiment, my kitchen has been unadventurous although you cannot beat sliced tomato, fresh mozzarella and bit of pesto for dinner! Each evening for the past week, I've been busy planning for an upcoming trip to Paris. It's been 5 years since I was there and 15 years since I lived in France. I am looking forward to speaking French, drinking GREAT coffee, eating GREAT food, and buying an Hermes scarf. I'm meeting my parents in Chicago and we're flying over specifically for the Paris Airshow. Frankly I don't care if I see another airplane after a 9 hr flight in COACH from O'Hare, BUT my dad is on an expense account so Mom and I thought we would tag a long and pay for ourselves to have a good time while my dad is working. Or perhaps I should say "working". My dad is the kind of person who thinks standing around near airplanes and talking to people is fun. Probably more fun, in fact, than La Musee D'Orsay! The top Paris restaurants for food, according to Zagat's, are Taillevent (also #1 most popular), Pierre Gagnaire, Alain Ducasse, Cinq, and Guy Savoy. These are the kinds of places were you could easily spent $600 on dinner for two. I cannot think of anywhere quite like that in the US except maybe Per Se in NYC. Anyway, neither the expense account nor my parents are too keen on those kinds of prices. What cost that expensive anyway? Edible gold-leaf foil encrusted lobsters stuffed with truffles and beluga caviar? The only way to hit these restaurants is to go at lunch when they have fixed price menus for around $150. That's still a pretty penny, n'est-ce pas? I have already booked tables at two wonderful places: L'Angle du Faubourg (sister restaurant to Taillevent minus the stratospheric prices) and Antoine Westermann's Drouant (one Michelin star). I am also determined to eat at a cheese shop/restaurant called Androuet sur le Puce, to have some escargots, and to eat pastries every day. I'll be rolling back to Raleigh. Remember what I said about dieting? In a very round about way, I stumbled across a fellow food blogger in Dallas. At the end of 2006 he did a very compelling set of 10 postings about a luxury chocolatier called Noka once he realized that people spending 80 bucks on 4 tiny tiny pieces of chocolate were basically buying chocolate at the rate of $2000/lb. The story is a good read. I am way too lazy to endeavor such an investigative report on my blog, so I relish in delight when other people have done these things. He discovers that Noka is all about marketing. The company uses words very cleverly to persuade people to pay a premium for a "luxury" chocolate that costs them about $11/lb. wholesale. In addition, the company saves expense by not having any true craftsmanship. Noka is selling a dream of the simple luxury of pure chocolate unencumbered by (gasp!) vanilla or (heaven forbid!) caramel. The blogger would probably say that their marketing crosses the line of creative license into the realm of pretence and, I daresay, fraudulence. Noka might say the blogger crosses the line of investigative journalism into the realm of calumny. Either way, it is an entertaining read! And I don't know about you but I'm not paying more money for a pound of chocolate than I spend on clothes in an entire year. Chest out, stomach in and swing your hips. If you are a man, don't swing your hips and be sure you can still see your feet. You have not lived until you've eaten battered and fried zucchini flowers! Not having my own garden, I have never been able to procure the flowers until now. I bought some at the farmers' market this morning. I fried them up for my dinner. They were simply heaven with a very light, subtle squash flavor and a tender sweetness. In spite of being battered and fried, they are not overly heavy. The Italians have been cooking these flowers forever! When I was a kid my dad and grandfather grew more zucchini than we could humanly consume. Unfort, Midwesterners in the 70's didn't fry up zucchini flowers! We didn't even have olive oil in the supermarkets back then. If you can find these flowers or if you grow zucchini get them! Call me if you have any extras. 1. Wash them and trim the stems to about 1 inch long. Gently open the flowers and pull out the stamens. Put the flowers upside down in a colander to dry thoroughly. 2. Put a beaten egg in one bowl. Put a cup of flour seasoned w/ salt and pepper in another bowl. 3. Put a cup of olive oil or canola oil in a cast iron skillet. While it is getting hot on medium to medium high heat, dip the flowers in the egg and then in the flour. Put the flowers in the hot oil (if the oil does not sizzle when the flower goes in, it is not hot enough) and cook until it turns golden on one side. Flip over and cook until the other side gets golden. I don't know how long it takes. Maybe a couple of minutes per side. Cook the flowers in batches and drain on a paper towel. Now that the season for corn is coming up, I highly recommend that you try this salad. It is so good and only fresh corn will do!